Lesley Gore, Famous For Her Song 'It's My Party,' Has Died : The Two-Way Gore was most known for her anthem of teen angst, but her career had multiple hits, as well as an Oscar nomination. 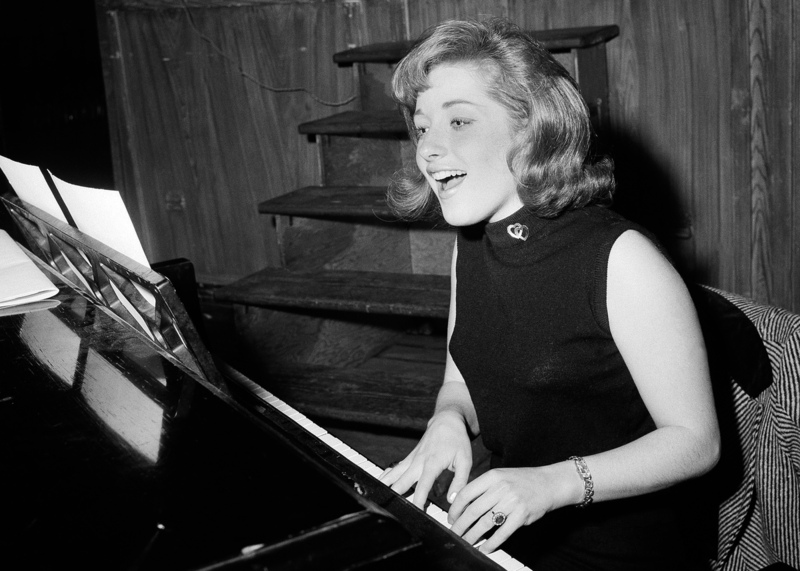 Singer Lesley Gore rehearses at a piano, in New York in 1966. Gore topped the charts in 1963 with the epic song of teenage misery, "It's My Party." Lesley Gore, a teen artist embraced by other teens when she sang "It's My Party" in 1963, died Monday of cancer in Manhattan. She was 68 years old. Gore's string of hits came before 1960s counterculture reached its heights. Gore's clear emphatic and authoritative voice helped her define the sound of the post-Elvis, pre-Beatle rock and roll. And her first hits helped set the stage for later hits such as Aretha Franklin's "Respect" or Cyndi Lauper's "Girls Just Wanna Have Fun." Gore was one of the first teen sensations. Her signing to the Mercury record label not only started her recording career but restarted the career of Quincy Jones, who had just become head of A&R for Mercury Records. "In the beginning, I was not dealing with pop hits at all," Quincy Jones told NPR's Morning Edition in 2001. Jones was struggling as a record executive. "They had a demo of this little girl that had been submitted, and I caught it as it was being thrown back ... to Irving [Green, then-president of Mercury records]," Jones said. "And I liked it because she sang in tune, and she had a nice sound, a very identifiable sound, and that was the first pop record I made, was Lesley Gore, 'It's My Party.' "
Jones mentored the then-16-year-old Gore. "He taught me what to do in the studio. He taught me how to do it," she told World Café in 2005. "But he felt it was really important for me to understand live performing." Jones took Gore on a tour of New York's jazz club scene where she learned from greats such as Peggy Lee and Sarah Vaughn. "He would literally talk to me during the performance and say: watch this, look at this, listen to what the drummer does," Gore said. In addition to her pop and jazz education, Gore graduated from Sarah Lawrence College. She stayed in school even as her songs climbed the charts. Gore had follow-up hits such as "Judy's Turn to Cry," "That's the Way Boys Are" and the feminist anthem "You Don't Own Me," which had a resurgence in the 2012 election when Gore helped promote it as a song about women's reproductive rights. Lesley Gore was born Lesley Sue Goldstein in Brooklyn. She grew up in New Jersey. According to interviews, Gore took her first singing lessons shortly before her first pop hit. In the '70s, Gore turned to songwriting. She was nominated for an Academy Award for "Out Here on My Own," a song she co-wrote with her brother for the movie Fame. After being away from the spotlight for decades, Gore hosted a PBS documentary series called "In the Life," focusing on gay and lesbian issues. She officially came out on the series, acknowledging her partner of decades, Lois Sasson. In 2005, Gore returned to the studio to record what would be her comeback album, Ever Since, which won critical acclaim. "She was a broad, she had moxy, she was tough," said friend and record executive Blake Morgan. He helped Gore record and produce Ever Since. Morgan said he had to reach for words from bygone eras to describe Gore's talent. "She had all of that," Morgan said. "And she had a strength ... There was something incredibly compelling about just who she was, on or off the record."